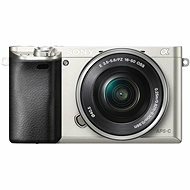 Photo Frame Hama Slimline Basic 8SLB 8"
Enjoy the power and flexibility of a digital camera with an interchangeable lens - the new Sony Alpha 5000 - the world's lightest digital camera with an interchangeable lens. 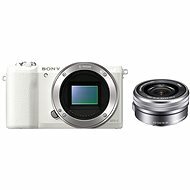 The camera features a 20.1Mpx Exmor R sensor, a Sony G 30× optical zoom lens, F3.5-6.3 aperture, 24-720mm focal length (after conversion, photo 4:3), a BIONZ X image processor and NFC + Wi-Fi for controlling the camera and transferring photos. This remarkable sensor has all the prerequisites to capture top-notch photos: peak sensitivity, extreme and dynamic ranges, unmatched details and low noise levels. With this latest Sony image processor, you can expect only exceptional results: more faithfully rendered colours, better noise reduction, and incredibly true-to-life details along with high processing speeds. Take a picture, touch and share - all in a moment. With built-in Wi-Fi® and NFC connectivity, you can wirelessly transfer photos and videos directly to your smartphone or tablet. You can even turn your phone into a remote control and zoom in, sharpen, and take pictures using the free PlayMemories Mobile application for smartphones. Now you can easily capture yourself striking the perfect pose - alone or with someone special. Simply flip the LCD screen up and fine-tune the composition. For the best results, Soft Skin Effect intelligently smoothes any wrinkles or dullness. The image effect feature allows you to convert everyday scenes into artwork. Experiment with thirteen modes for pictures or videos, and view them in real-time on the LCD screen to create that perfect image. Bayonets are used to attach lenses to the camera body and some types of compacts. In addition to the mechanical coupling, the bayonet ensures communication between the camera and lens due to the fixed attachment being made of metal. Types depend on the brand of the lens, with each manufacturer offering its own mounting system. USB 2.0 interface, WiFi wireless interface, NFC wireless interface Done! DPOF (Digital Print Order format) Done! Strap, USB cable, Manual, Power cord / adapter, Lens cap, Body cap Done! 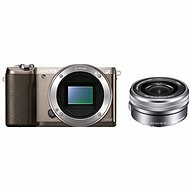 For shipping to other EU countries visit this page Sony Alpha A5000 Black + 16-50mm and 55-210mm Lenses. Für Versand nach Deutschland, besuchen Sie bitte Sony Alpha A5000 schwarz + Objektive 16 - 50 Millimeter und 55 - 210 Millimeter. Chcete doručit zboží do Česka? Prohlédněte si Sony Alpha A5000 černý + objektivy 16-50mm a 55-210mm. Chcete doručiť tovar na Slovensko? Prezrite si Sony Alpha A5000 čierny + objektívy 16–50 mm a 55–210 mm. Für Versand nach Österreich, besuchen Sie bitte Sony Alpha A5000 schwarz + Objektive 16 - 50 Millimeter und 55 - 210 Millimeter. Magyarországra történő kiszállításért tekintse meg ezt a termékoldalt: Sony Alpha A5000 fekete + objektívek 16-50mm és 55-210mm.